Local college students from nearby South Wigston have helped create a new home for Romanian orphan twins. South Leicestershire College’s Painting & Decorating students renovated the brothers’ home following the death of their adoptive mother to cancer at 42, the second time in their lives they’ve been orphaned. Ionuts and Dumitru left their Romanian orphanage as babies, where they had numerous health problems, when they were adopted by Ruth Langham from Leicestershire. 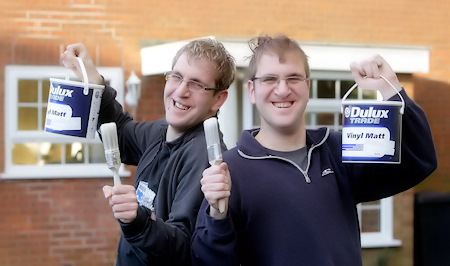 Now 24, they continue to have significant health difficulties and were overjoyed that students from the college volunteered to help renovate their home. With free paint donated by Dulux and support from Lincrusta’s Technical Manager, Andy Sarson, the entire house was decorated allowing the twins to lead a relatively normal life. South Leicestershire College students on the work experience painting project pose for a group photo. SLC students regularly carry out work experience through community based projects.